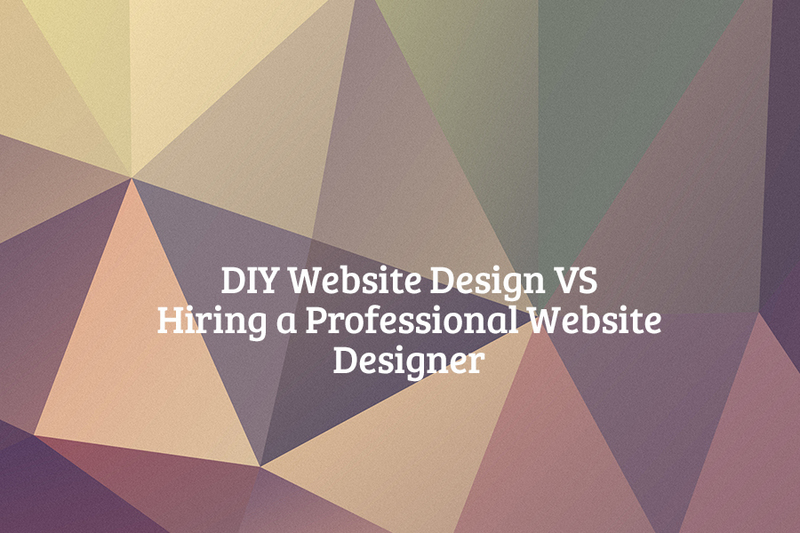 DIY Website Design VS Hiring a Professional Website Designer – Which Option is Right for your Business? Choosing the right website design partner is an important first step when designing a new website or redesigning a current website. The design, coding and implementation of your website is much more than a task that you are depending on. The agency or freelancer you select should be viewed as an essential member of your team; for brand development, website design and online business strategy. Of course there are many different choices when selecting the right person to build your website. You may not necessarily know what you need for an effective website presence, and this fine. This is why you hire a professional – they will know how to lead you through the process of discovery. We work with 2 types of clients. 1. Those who have a fairly good idea of what they are looking for and have already done the discovery work upfront. 2. And those who need help with the entire process. The first type of client, the DIY (do it yourself) might be looking for a WordPress Consultant to help them with some of the website build or to help extend the functionality. What does the DIY client need and what does this fit look like? If you know what you want and you have enough knowledge and confidence to build your own site utilizing a premium theme, you can hire someone to assist you in the process of building your WordPress website. This person can offer you assistance and direction, help you with the more challenging aspects of customizing code, unique design, extending the functionality, adding effective SEO strategies, working on the responsive part of the site and directing with content creation, social media engagement strategies, website promotion and call to actions. 1. You have a keen understanding of WordPress and knowledge of themes, building pages, adding content and images, adding plugins, security, backups and are familiar with best practices in website development. 2. You would select a Premium theme such as Divi, Genesis Themes, Woo Themes, etc., and would have clear instructions and communication for your WordPress Consultant. For the sake of this example, let’s say you choose a beautiful Divi Theme. You would have and a vision on what you would want your Divi website to look like or do. A Child theme would be created from Divi for your business and you would know what a Child theme is, since you have knowledge of WordPress. 3. You would hire the WordPress design consultant to customize the theme with a new design, help you with technical aspects and help you with implementation to ensure that your website build is correct and that all the components added to the site are working as they should. This second set of eyes, so to speak, would provide the peace of mind that “yes, it’s all done correctly”. 4. Why on earth would you, if your not a professional website designer, do this? First as a DIY, your really enjoy it and you want to learn more. Your patient with details, have a knack for design and figuring things out, your savvy online and with WordPress. And you want to save costs since you have done the discovery work upfront of what the business goals are, what the build is and what the results are that you’re aiming for. You have the content, you have your images and you are at the starting gate ready to go. Building a website is time consuming, on average 35 hours and more depending on design, complexity, content, requirements and ongoing changes. You can save time on your project and expense if you take care of the 30% of the project. You’re not a DIY and are ready to invest in a website professional to build your website. 1. You have done your discovery upfront. Not the discovery of what you are building and the strategy (since this is why you are hiring a professional), but the discovery of who the website company or freelancer is that you are hiring. 2. Hiring the right web person will save you time, money, hassle, stress, and much more. We have heard the stories of how a website company has held hostage domain names and websites that rightfully belong to the client. We have heard stories of how many website companies a client went through to actually find the right company to deliver. One of the most important elements up front even before determining skill levels, experience and personality fit; is honesty. When evaluating the company or person you are thinking of hiring, first of course you check out their work to see what they can do. You read the About page to see if they are a real person. You read their testimonials, visit their social media pages (if they are advertising that they are professionals in social media and have no online presence this is a red flag) you can also do a Google search of them. Once you have established the credibility of your website design professional set up a meeting. After your initial meeting with your web person, online or in person; if you are considering hiring them, ask for references. Follow up with the references. 3. If all of the work is done remotely it’s important to be good at expressing and communicating what you need and like. It’s easy to read between the lines when there isn’t face-to-face. And even with a face-to-face it can be challenging. If something isn’t clear, question it. I believe it’s better to over-communicate than to assume your clearly understood. Add emotion icons, happy faces, etc., anything visual to communicate personality in your text messages. 4. When communicating project goals and the website design strategy a professional should have some measures in place to make sure everything is clearly understood, documented and that the project is scoped out accurately. Worksheets, branding kits, online sharing of ideas through Dropbox or project management systems, even Pinterest to show your designer what you love. Once a budget is established and the cost of your website and deliverable, measurable goals should be set. In each step of the process a professional will keep you informed and request your feedback. 5. Can your website person deliver? It’s important to know this and the steps that are taken to ensure your projects completion. Sometimes getting to the finish line can be the hardest part of the web project and you want to work with people with a proven track record. When it’s all said and done, be sure your website company or freelancer is supportive and easy to work with! Want to find out if Rosepapa Creative is the right fit for your website project? Contact us for a free consultation.